It's been difficult to gauge just how much better Intel's 5th-gen CPU is over the 4th-gen, until now. Intel’s fifth-generation Broadwell CPU has been the default laptop processor of choice since its debut in January, but it’s been difficult to get a real bead on just how much of an improvement it really was over its Haswell predecessor. That’s because unlike desktops, where it’s easy to control the environment they run in, laptops are complete packages. I tried to compare the updated ThinkPad Carbon X1 Carbon with Broadwell to the Haswell ThinkPad Carbon X1, for instance, but it wasn’t quite apples-to-apples. 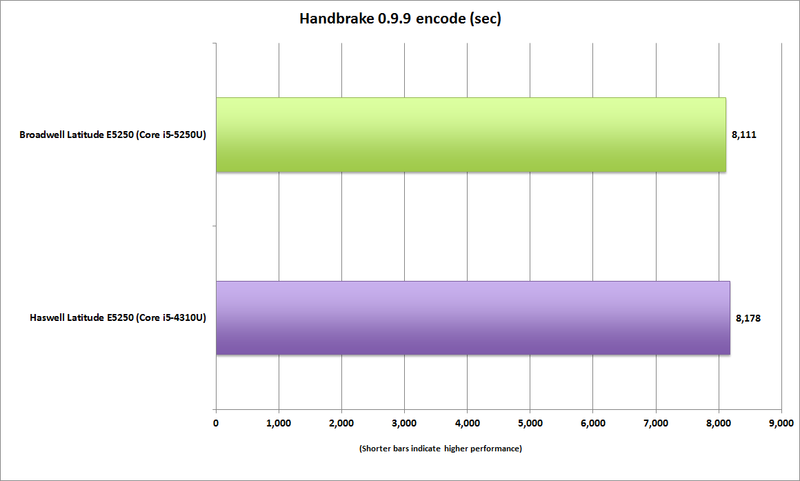 I initially determined that the Broadwell CPU was significantly faster than the Haswell. Something didn’t ring right, though, and ultimately I decided Lenovo’s redesign of the laptop likely contributed to the results and really made it useless to try to draw any conclusion on the CPUs themselves. My second chance came when I found upon two laptops that were identical—save for the CPU. Dell’s commercial Latitude E5250 at one point simultaneously shipped with Haswell and Broadwell parts. 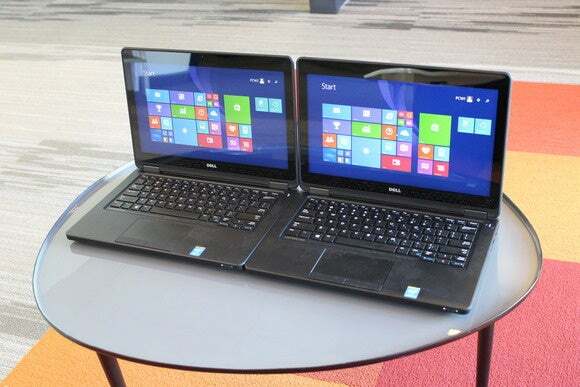 The Dell Latitude E5250, at one point, came in both Haswell and Broadwell trim making it the perfect test for testing. The chips are very close. The Haswell-based E5250 uses an Intel Core i5-4310U, a dual-core chip with Hyper-Threading and a rated clock speed from 2GHz to 3GHz. The Broadwell-based E5250 has a Core i5-5200U that’s also a dual-core with Hyper-Threading and ranges from 2.2GHz to 2.7GHz. While the Broadwell’s base clock speed is a little higher, its top speed is a bit lower. Perhaps more importantly, both CPUs are also the same price. For graphics, the Broadwell has Intel HD 5500, while the Haswell has Intel HD 4400 graphics. If you want to see more details of the two CPU competitors, I’ve lined them up right here at Intel’s ARK site. Everything else, from what I can tell, is the same. Both feature touch-panel, 1920x1080-resolution displays, 256GB Samsung mSATA PM851 mSATA drives, 8GB of DDR3L RAM in single-channel mode, the same 51-watt-hour capacity batteries, and the same Windows 8.1 OS. In fact, both even use the same motherboard, which I visually confirmed by opening up both E5250 laptops. The only difference in the motherboard is one has a Haswell soldered down to it, while the other has a Broadwell soldered down to it. This is no surprise: Intel designed the Broadwell to be “drop-in” compatible, and many makers did just that. For benchmarks, I stuck with tests that would isolate the CPU performance as much as possible. 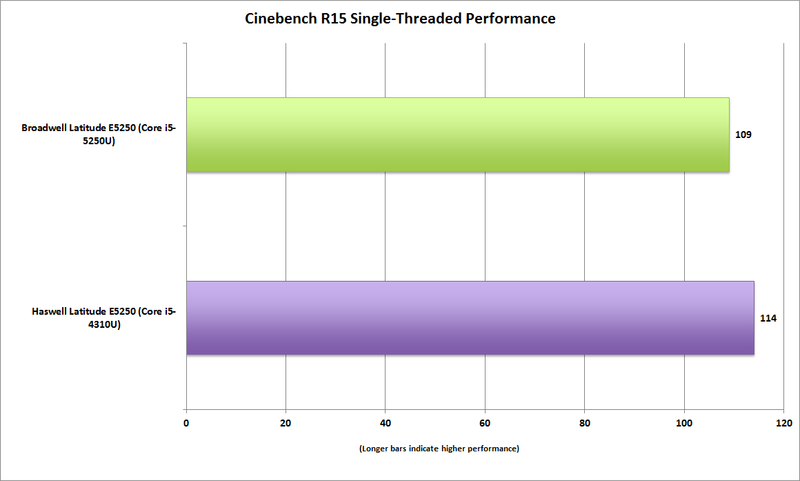 First up is the pure CPU benchmark Cinebench R15, which measures a chip’s performance rendering 3D. The performance, for the most part, is very close—but surprise, the Haswell chip actually wins here. I suspect that’s because the single-threaded mode gives the Haswell chip a small advantage due to its higher clock speed when on Turbo Boost mode. The Broadwell tops out at 2.7GHz vs. the 3GHz of the Haswell chip’s top speed. That gives the Haswell chip about a 10-percent clock speed advantage. 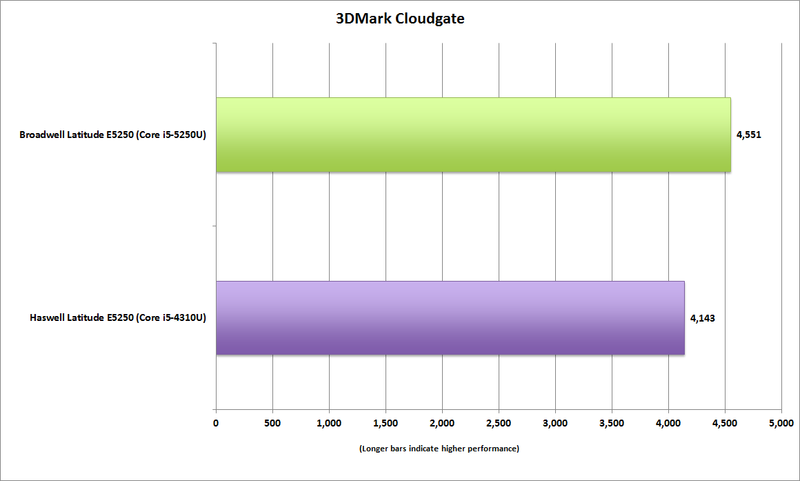 The good news for Broadwell is that its improvements in performance close the clock speed gap. 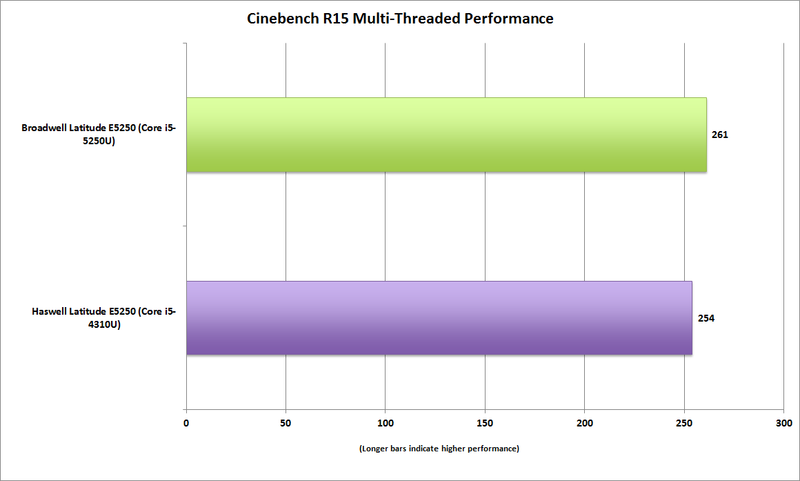 Despite that roughly 10-percent clock speed difference between the two, the actual performance gap in Cinebench R15 is closer to 5 percent. 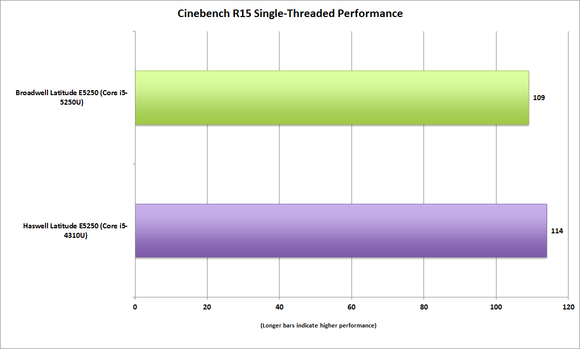 Cinebench R15 in single-threaded mode measures CPU performance and isolates just one core. What happens when you run CineBench R15 in multi-threaded mode, though, where it measures the overall performance of all the cores in a CPU? We see the Broadwell come back to edge out the Haswell chip. This is because, while the Broadwell chip is slower in overall clock speed when only one core is working, it runs a little cooler (thanks to its 14nm process). The Haswell has an advantage in the beginning, but as it heats up, it starts to throttle back on frequency so it’s only about 100MHz faster by the end of the test. Combined with the better efficiency of Broadwell, it’s just enough to make the 5th-gen chip barely faster here. 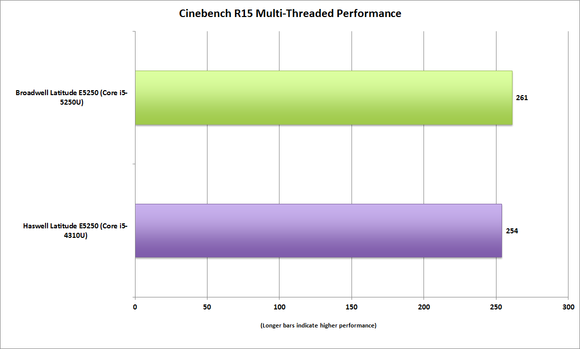 Despite being slower on single-threaded tasks than the Haswell chip, the multi-threaded performance makes up for it. I also ran PCMark 8’s Work test using the conventional setting. This keeps the workload to the CPU side instead of using a little of the graphics core for some tasks. PCMark 8 Work test is designed to simulate such tasks as videoconferencing, and general-office droning. PCMark 8’s not heavily multi-threaded like CineBench and doesn’t heat up the Haswell enough to make throttling a big problem. The Haswell CPU’s slightly higher clock speed gives it the advantage here, but for the most part it’s not enough to write home about. It’s actually a fairly realistic evaluation of the low demands of mundane office tasks: The dual-core Haswell laptop scores 2,922. Consider that a tested desktop (not shown here) with a six-core Core i7-5820K scored 3,321. 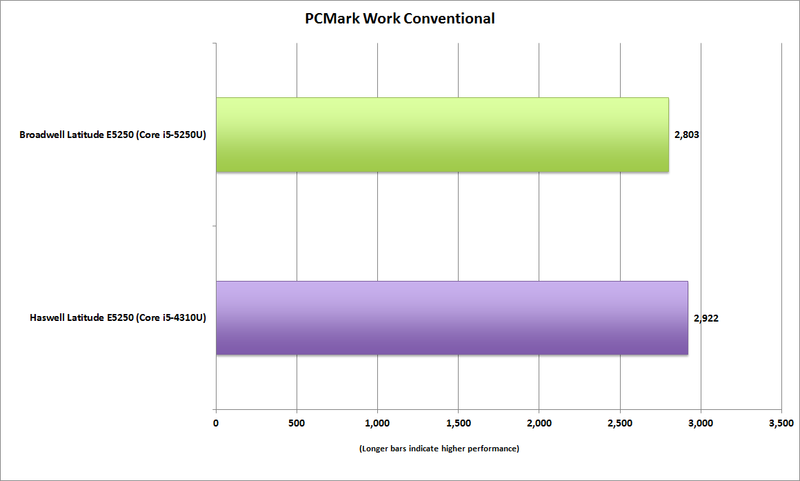 That tells me PCMark 8’s right on the mark for office tasks and you don’t need that many cores for office work. In general work loads, the higher clock speeds of the Haswell give it a slight advantage. Looking for a heavier-duty task, I also threw in our standard encoding test, where we take a 30GB, 1080p MKV file and use Handbrake to transcode, using the Android for Tablet profile. On dual-core machines, it takes in excess of two hours to complete. This test tells us two really useful data points. The first is how well a particular CPU performs in this heavily multi-threaded test. Short of an 18-core CPU with 1080p resolution files, it’ll max out all cores. The second data point you get from this test is how much the design of a laptop suffers from thermal throttling. Modern CPUs are designed to slow down when they get too hot or if the PC maker determines it’s heating up the entire laptop too much. For example, if you look at the Handbrake test in my recent review of the Lenovo LaVie Z, you can see how much certain PC designs will throttle back the CPU’s speed—the review’s Handbrake chart shows the impact of thermal throttling from the Surface Pro 3 and the Lenovo ThinkPad Carbon X1, both of which have the same CPU. If you look at the result from the HP Spectre x360 and compare it to the Dell XPS 13 that has the same CPU, you also see the performance drop-off to aid and abet the cooling capability of the laptop (or the decision by the laptop maker not to heat it up too much). With all that said, let’s now look at the results from the Broadwell and Haswell units. Both use the exact same cooling system, from what I could tell looking inside both. The Broadwell technically loses here, by less than 1 percent. But when you remember that the Haswell technically has the higher clock speed, it’s actually a win for the Broadwell to be so close. In our Handbrake task, the older Haswell and the newer Broadwell are almost dead even. While Intel says Haswell-to-Broadwell performance shows maybe a 5-percent difference on CPU functions, on graphics the company says the spread’s more significant. That shows up in 3DMark, where the Broadwell-chipped Dell offers up about 10 percent more graphics performance in Cloudgate. I even saw a 15-percent difference between the two when the graphics load is scaled back further to 3DMark Ice Storm Extreme. Don’t fool yourself—you won’t be playing Batman: Arkham Knight at 4K with either CPU, nor any recent graphics-intensive game, but a game of Minecraft, Counter Strike or Portal 2 with the settings turned down enough are playable. Broadwell features an improved graphics core over Haswell and that shows up here. My last benchmark chart for the mobile dual-cores is the most important one for the applications in an ultra-portable laptop. Let’s be realistic: People aren’t encoding 4K video or playing Battlefield 4 on these laptops, they’re pushing browsers, Office and maybe Photoshop, or coding on them. All within the performance envelope of a dual-core processor. What people care about most is the battery life. MobileMark 2014’s Office Productivity battery test uses common applications such as Word, Acrobat and Chrome to simulate a day of pushing mundane office tasks while on a battery. The test even lets the laptop go to sleep for a few minutes, when the typical office drone might be checking their phone or chatting to the person in the next airplane seat. Here we see the 14nm Broadwell CPU pay off very healthy dividends over the 22nm Haswell CPU. Remember, both laptops use the exact same-capacity battery, SSD, OS and just about everything else. For the record, the RAM chips were different, as were the battery makers, but they used the same specifications. With all things being equal, a 10-percent improvement in battery life is significant when you consider that Haswell was already an outstanding performer. 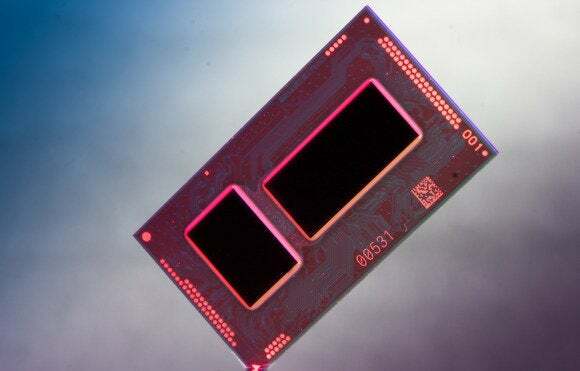 Haswell significantly moved the ball forward over Intel’s 3rd-generation Ivy Bridge CPU. Matt Smith actually did a somewhat similar test, pitting an Ivy Bridge laptop against a Haswell laptop. Both laptops were similar, but Haswell CPUs required a wealth of new components such as chipset and voltage changes, so comparisons don’t really isolate just the CPU. I’m fairly certain that if the laptops used here had CPU sockets and I could switch the chips, my results would be the same. Here’s the one that matters: Broadwell is indeed better at battery life than Haswell but probably not enough to make you jump ship. Broadwell cuts both ways. Broadwell is better than Haswell by 5 percent to 10 percent or so on a given task when the CPU models are exactly the same. Battery life is better by 10 percent or so. Graphics performance is much improved, but it’s still just integrated graphics, best suited for office dronage or low-ambition gaming. If you were to buy a laptop today, Broadwell is the way to go—if your options are between a Broadwell-based CPU and a Haswell-based one at the same price. If you have a Haswell-based laptop, however,there’s no point in upgrading to Broadwell. I don’t expect that many people who bought a Haswell-based laptop in 2014 are deciding to upgrade to one with a Broadwell CPU a year later just for the CPU. They might upgrade for pen support, a better screen or a larger SSD or keyboard, however. This information is really aimed at those using even older, 2nd-generation Sandy Bridge CPUs or 3rd-generation Ivy Bridge CPUs. Moving to a modern Broadwell laptop would deliver significant improvement in battery life and clock-for-clock performance, not to mention all of the other advances in screen quality, touch and SSD support. For those replacing an older laptop, Broadwell is the better CPU, and our tests prove it.